So, I’m pushing on with the Spring inspired recipes. And this Skinny Whipped Feta Dip is topping the charts. To go along with the Spring season, I picked up some Spring inspired essentials. Namely, fresh produce including zucchini, tomatoes, lemon, and dill! This Skinny Whipped Feta Dip is a delight and it’s a cinch to make. 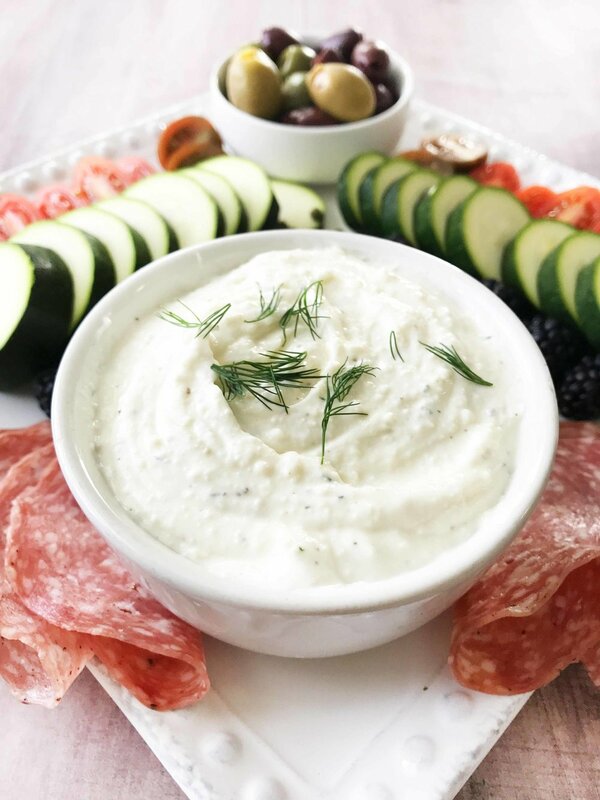 Just whirl everything around a food processor for a bit and you’ll end up with this heavenly dip that is perfect for any wine and cheese night or crudités plate. We’re having a wine and cheese night tonight in my house, so I whipped this delicious dip up ahead of time. Yep! That’s right, you can make this dip ahead of time. Which means you really do get to enjoy it yourself when the time comes to sit down and nosh it out. One of my favorite things about this dip though, is that you can enjoy it cold OR not. So no matter what the fickle Spring weather decides to do - you’re golden. I served mine Skinny Whipped Feta Dip with a Spring inspired vegetable plate, crackers, salami, and cheese. 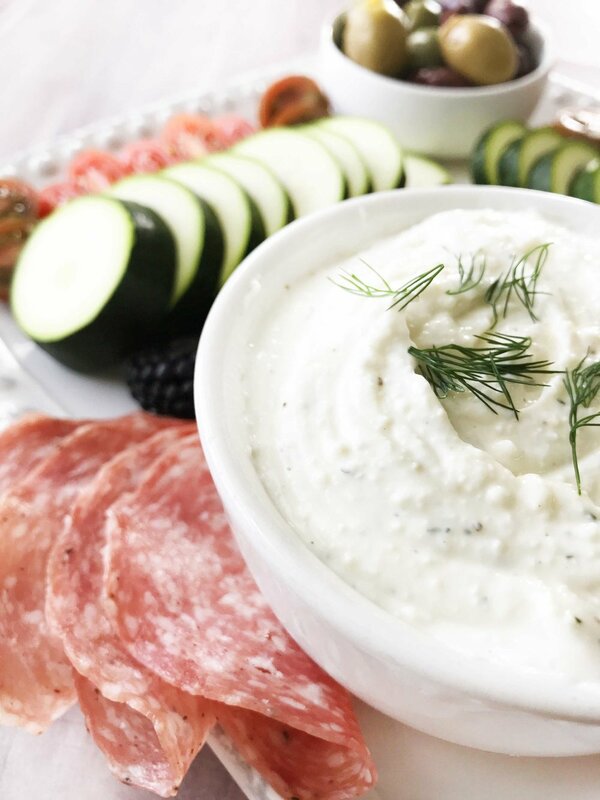 But, no matter how you divide to pair it up, this dip will be sure to impress! A lightened up take on a fun, easy, and delicious dip that's perfect for any crudités or wine and cheese plates/pairings! Feta, lemon, and fresh dill elevate this impressive spread. Place the 4 Oz. cream cheese into a blender or food processor and blend until smooth. Add in the 6 Oz. feta, 1/3 C. greek yogurt, 2-3 garlic cloves, 1 Tbsp. lemon juice, dill, oregano, and salt & pepper to taste. blend until smooth. Blend again until well combined. blend until smooth. Transfer to a serving dish, cover, and chill for at least a 30 minutes. blend until smooth. Serve once ready with your choice of dipables!